Preheat oven to 400 degrees. Wash the beets, cut off tops (try them steamed or sautéed) and place the beets and one tablespoon of water in enough foil to wrap each beet. Or place the beets in a covered baking dish with enough water to cover the bottom of the dish. 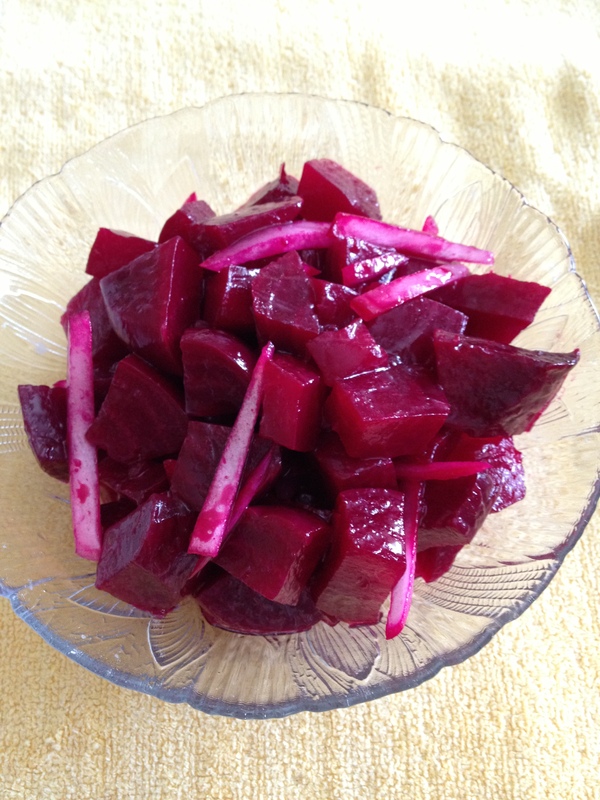 Cook the beets until soft, about 60-75 minutes. When beets are cool enough to handle, the skin should easily peel off. Slice beets into thick bite size pieces. Place into a container and add red onions, vinegar and oil. Mix well and refrigerate covered for several hours or overnight. Serve cold as a side salad or on a green salad.